Master Troll. Card Artwork. Monster Class: Teacher of UnderBridge Academy for Higher Education. Ever wonder how trolls know exactly how to be, "Trolly". Well, the Master Troll is the high educator of all things involving troll behavior and culture. 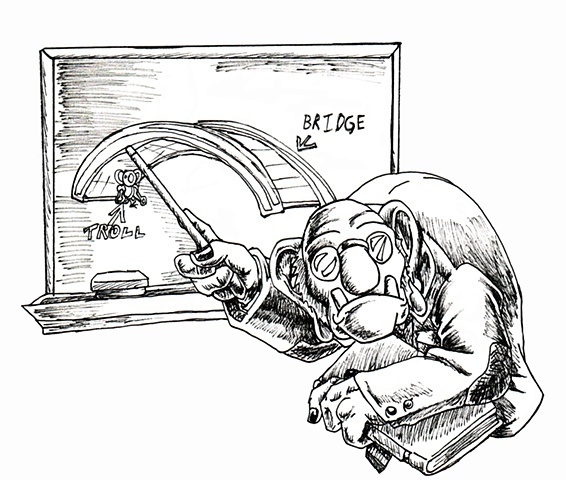 This esteemed educator teaches at the UnderBridge Academy of Troll Education to teach trolls such valuable lessons as, Bridge Habitat Maintenance, Billy Goats: Eternal Enemies, Iron: Our One Weakness, and Your Family: Best Friends or Bitter Enemies. This was one of the early ideas that my friend came up with for the card game as creating a troll teacher for troll education. I pretty much drew it and added the Bridge lesson as a capper to it. Plus the suede patches on the jacket gave it a college professor vibe.